All dances AZ, dance school, dance info, dance hits, dance tips, dance class, dance films, dance steps, dance partner, dance clothing, history, dance party, quickstep, learn to dance, disco-boogie, rhythm and tempo, ..
Lord Of the Dance F.
Lord of the Dance M.F. The Bolshoi theater is a Moscow theater for ballet and opera. It is situated on the Theatre Square near the Little Theatre. The building was designed by the architect Joseph Bové, the face defining Quadriga was designed by Peter von Clodt Jürgensburg. In Bolshoi theater you can not only enjoy spectacular opera and ballet performances, the building itself is impressive. The first (Petrovka) theater was opened in 1780, but burned down in 1805. In 1825, the second theater by architect Andrei Mikhailov was already there, but it burned down too. In 1856 Albert Cavos made ​​a reconstruction, which still stands. The large hall can accommodate 2,500 people and there are 120 lodges. The building is richly decorated, including several sculptures by Pyotr. It houses the Ballet, the Ballet Academy and the Opera. Theaters were owned by the Tsar. Moscow and St. Petersburg had two. A large (Russian: bolshoi) for opera and ballet, and a small (Russian: maly) for tragedy and comedy. From 1840 foreign composers were also admitted. During World War II, the theater was hit by a bomb, but soon recovered. 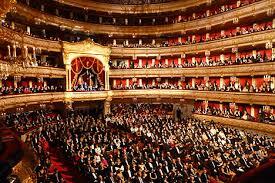 At the Bolshoi are many historical and famous premieres given.